I got out of the house today. I tried the baby in the sling and went to Sam's Club for announcements. I caved and bought the 30/$10 photo greeting cards, even though I don't like them as well as handmade. They turned out prettier than I expected. Having them printed in 30 minutes was too easy to resist. I did, however, find some beautiful handmade paper stationery at Salvation Army and tucked a small personal note to each recipient inside. 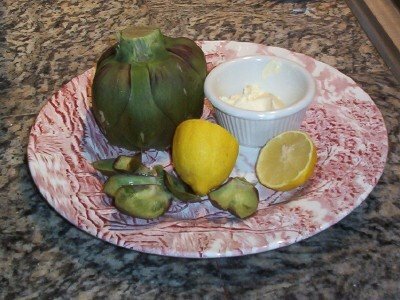 Later I was able to take a rejuvenating nap, and now I'm about to enjoy a steamed artichoke for dinner. All in all, a good day. A very good day indeed---and with beautiful babe in tow, very wise decision to go the quick route with cards. Thank you, Lord, for the lovely paper find at the Salvation Army. And did you make your own sling? We have found a very long silk scarf wrapped using one of the wrap directions at Ella-roo to just do the thing! Glad to hear you had such a good day--you deserve it! I am so thankful for your baby's health improving. I have been praying for you guys! Sounds like a fun day. I know what you mean about the birth announcements not being exactly what you might have wanted, but I have found that, after 4 kids, if I don't sometimes take the "less than perfect" route, nothing ever gets done! I just have to quell those perfectionistic tendancies I have and just get it done! So now you can enjoy the fact that you got them done, and they'll be sent out on their way in the next day or two. That's a good feeling of accomplishment! Did it seem a little more like a normal day today since you were able to get out a little bit? And as an aside, I have never tried an artichoke and wouldn't know what to do with one if I had it! Are they good?